For the last seven years, the San Jose Earthquakes MLS soccer team has hosted the Earthquakes Corporate Cup—a one-day, all-in tournament for Silicon Valley’s soccer-playing workforce. The cup, hosted at Santa Clara University and presented by Bud Light, invites companies from around the Bay Area to pit their most coordinated kickers against one another to score the highly coveted championship trophy. For the past four years, GoPro has sponsored a team of employees in the Cup. 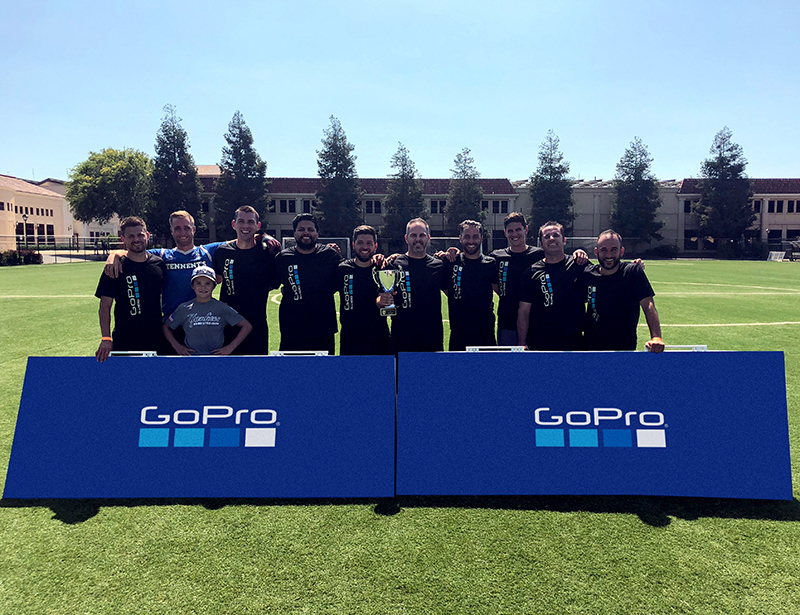 After nabbing second and third place wins in previous years, the 2018 squad was hungry for a W.
Led by Senior Agent Readiness Expert Kris Clark, team GoPro took to the pitch hotter than mid-summer Santa Clara heat. One-by-one GoPro picked off squads in the 16-team to make its way to the finals. Along the way, Clark scored an impressive 12 goals in five games, earning the Golden Boot award; his third in three years. GoPro stayed strong through the final stretch and ultimate came out on top, clinching the 2018 Corporate Cup Title. The team is already excited for 2019 and looking to expand to both the men and coed divisions. Get ready—practice starts on Monday!